The Ifrane National Park was created in 2004 on an area of 51.800 ha. It covers the western portion of the Central Middle Atlas, the provinces and territories of Ifrane Boulmane. It is distinguished by its biological and ecological values, its forest wealth and the exceptional beauty of its landscapes. The park site is a real water tower. Permanent natural lakes and Dayet Aoua Aguelmam Afennourir, springs, rivers, constitute its major landscape entities. In Morocco, it is considered the forest area par excellence, marked by the presence of Atlas cedar, emblematic species of this protected area. 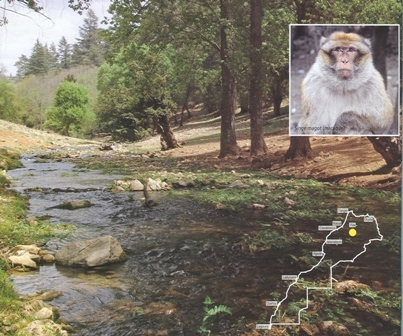 The Ifrane National Park contains a large animal wealth: 37 species of mammals including large populations of monkeys, 140 species of birds including some rare or endangered raptors and thirty species of amphibians and reptiles. The species of migratory birds from Lake Afennourir, ranked Ramsar wetland site, a place important stopover in their migration. At the park's cultural heritage blends with the natural heritage, which gives the site great ecotourism potential. Similarly, snow and winter sports equipment Michlifen are additional assets attracting many tourists in winter. Thus, this protected area is attractive during the four seasons.